Do you hone in or home in? See tip #1. Why do amount, basis, criteria, everyday, literally, myself, reflect, and unique frequently trip us up? When editing your message, why should the word very set off an alarm? What about exclamation points? What's the difference between a hyphen and a dash ... and how do you make a dash? What are two reasons to pause before starting a sentence with There's? Why might you want to develop a personal style guide? If writing should sound natural, what's wrong with tremendous and awesome? What is the least dynamic verb in our language? See tip #100. 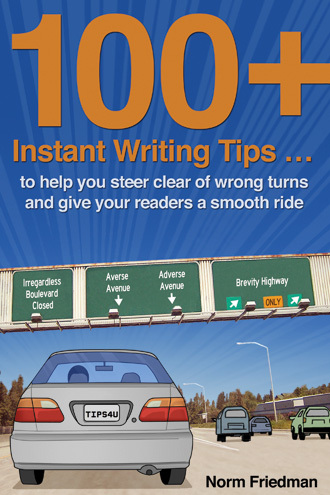 Learn more about what's included in 100+ Instant Writing Tips and read a few sample tips (PDF). As a contributing writer for Monster.com, I frequently interview employers about what they're looking for in prospective employees. The no. 1 unmet need, regardless of industry or occupation? Strong writing skills. With 100+ Instant Writing Tips, Norm Friedman begins to fill the gap. This slim guide is an accessible and valuable tool for improving the clarity and boosting the authority of any composition, whether it's a 400-page treatise or a 140-character text message. The book is really clever, concise, and crystal clear. I know I'll be turning to it often because you clarify issues I have thought about many times. You covered all the bases! An amazing accomplishment—a writer's guide that's entertaining, with no compromises on content. Can't this become the industry standard? Though the book is geared to the business writer, it is a great tool for the young person who's beginning to communicate about college, internships, and jobs. Contact me for questions or custom orders. 100+ Instant Writing Tips is published by Dash Press.